August 12, 2014: On October 19, 2014, Comet Siding Spring will pass by Mars only 139,500 km away--which would be like a comet passing about 1/3 of the distance between Earth and the Moon. The nucleus of the comet won't hit Mars, but there could be a different kind of collision. "We hope to witness two atmospheres colliding," explains David Brain of the University of Colorado's Laboratory for Atmospheric and Space Physics (LASP). "This is a once in a lifetime event!" Everyone knows that planets have atmospheres. Lesser known is that comets do, too. The atmosphere of a comet, called its "coma," is made of gas and dust that spew out of the sun-warmed nucleus. The atmosphere of a typical comet is wider than Jupiter. "It is possible," says Brain, "that the atmosphere of the comet will interact with the atmosphere of Mars. This could lead to some remarkable effects—including Martian auroras." The timing could scarcely be better. Just last year, NASA launched a spacecraft named MAVEN to study the upper atmosphere of Mars, and it will be arriving in Sept. 2014 barely a month before the comet. MAVEN is on a mission to solve a longstanding mystery: What happened to the atmosphere of Mars? Billions of years ago, Mars had a substantial atmosphere that blanketed the planet, keeping Mars warm and sustaining liquid water on its surface. Today, only a wispy shroud of CO2 remains, and the planet below is colder and dryer than any desert on Earth. Theories for this planetary catastrophe center on erosion of the atmosphere by solar wind. "The goal of the MAVEN mission is to understand how external stimuli affect the atmosphere of Mars," says Bruce Jakosky of LASP, MAVEN's principal investigator. "Of course, when we planned the mission, we were thinking about the sun and the solar wind. But Comet Siding Spring represents an opportunity to observe a natural experiment, in which a perturbation is applied and we can see the response." Brain, who is a member of the MAVEN science team, thinks the comet could spark Martian auroras. Unlike Earth, which has a global magnetic field that shields our entire planet, Mars has a patchwork of "magnetic umbrellas" that sprout out of the surface in hundreds of places all around the planet. If Martian auroras occur, they would appear in the canopies of these magnetic umbrellas. "That is one thing that we will be looking for with both MAVEN and Hubble Space Telescope," says Brain. "Any auroras we see will not only be neat, but also very useful as a diagnostic tool for how the comet and the Martian atmosphere have interacted." The atmosphere of the comet includes not only streamers of gas, but also dust and other debris blowing off the nucleus at 56 kilometers per second relative to Mars. At that velocity, even particles as small as half a millimeter across could damage spacecraft. NASA's fleet of Mars orbiters including MAVEN, Mars Odyssey and Mars Reconnaissance Orbiter will maneuver to put the body of Mars between themselves and the comet’s debris during the dustiest part of the encounter. 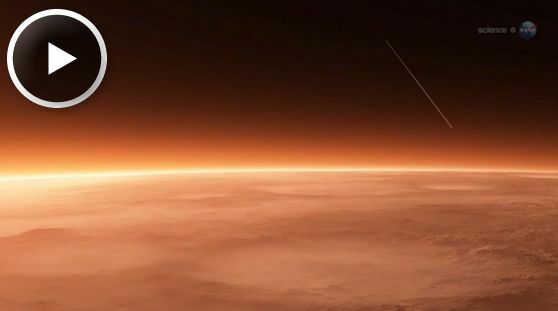 "It's not yet clear whether any significant dust or gas will hit the Mars atmosphere," cautions Jakosky. "But if it does, it would have the greatest effects on the upper atmosphere." Meteoroids disintegrating would deposit heat and temporarily alter the chemistry of upper air layers. The mixing of cometary and Martian gases could have further unpredictable effects. 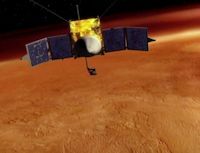 Although MAVEN, having just arrived at Mars, will still be in a commissioning phase, it will use its full suite of instruments to monitor the Martian atmosphere for changes. "By observing both before and after, we hope to determine what effects the comet dust and gas have on Mars, if any," says Jakosky. Whatever happens, MAVEN will have a ringside seat.